Has it occured to you that Oreo cookies are not just treats in of themselves? Many recipes in this blog include Oreos as ingredients. Here's another one for Oreo truffles. 1. Crush 9 of the cookies to fine crumbs in food processor; reserve for later use. (Cookies can also be finely crushed in a resealable plastic bag using a rolling pin.) Crush remaining 36 cookies to fine crumbs; place in medium bowl. Add cream cheese; mix until well blended. Roll cookie mixture into 42 balls, about 1-inch in diameter. 2. 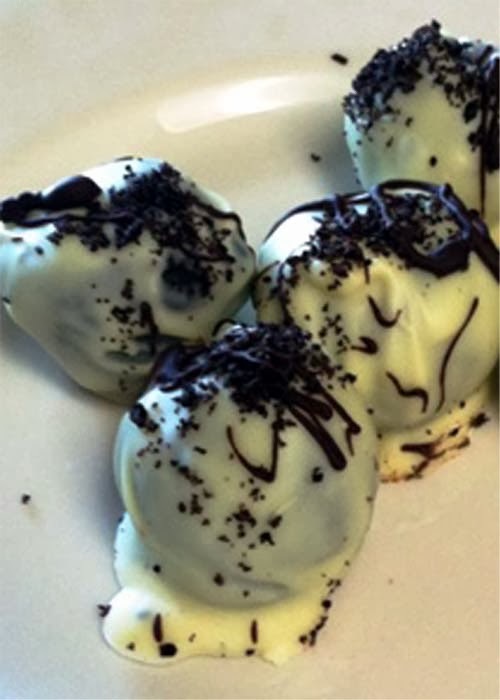 Dip balls in chocolate; place on wax paper-covered baking sheet. (Any leftover chocolate can be stored at room temperature for another use.) Sprinkle with reserved cookie crumbs. 3. Refrigerate until firm, about 1 hour. Store leftover truffles, covered, in refrigerator. Instead of using semi-sweet baking chocolate, Baker's Premium White Chocolate Baking Bars were used along with finely crushed Oreo cookies (not the fillings). See recipe for Cookies n Cream popcorn for more Oreo-based treats.